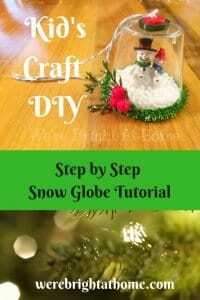 I hope you enjoy this step by step snow globe tutorial. Our family has always made at least one handmade Christmas ornament a year for our tree. It has been a tradition for a long time. Every one of them tells a story. I remember every story behind all of them. 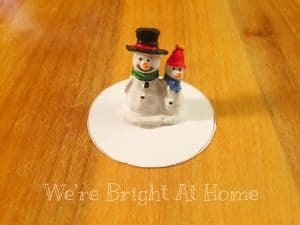 I wanted to share the Christmas ornament idea that my son, Jackson and I are making for our Christmas tree this year so you can create some memories of your own. It’s a full-length tutorial. 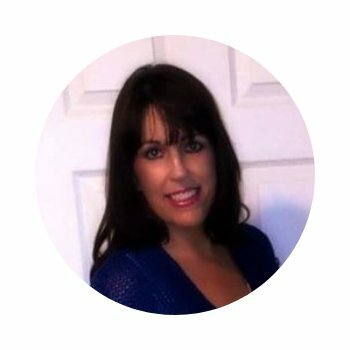 It is super easy and affordable. I bought everything we needed to make the ornament at the Dollar Tree. 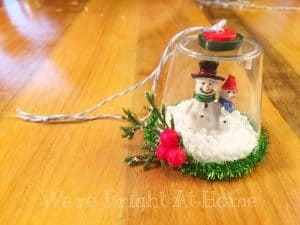 So if you are looking for a cute handmade ornament to put together with your kids, your class or Sunday school class, read on. And of course, read on if you like super easy tutorials that will leave you with an adorable craft inthe end! Let’s get to the tutorial! Take the shot glass and trace around it on the card stock and on the decorative paper (I bought mine in the stationary at Dollar Tree. Cut just outside the traced line around the circle. You can also buy them already cut or use a punch. You can also use pinking shears for a more decorative look. Cut out circles from cardstock and decorative paper. 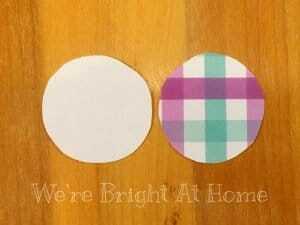 Glue the decorative circle to (decorative side out) to the bottom of the white circle. This is an optional step. Make sure when you choose your miniatures that they are small enough to stand under the shot glass. I bought two packs of 3 miniatures. There was only one in each that was short enough to stand under the shot glass. The Dollar Tree I shop at had many different choices to choose from. It won’t be hard to find some you can use. You can’t beat them for $1! Create your scene in the middle of the circle with the miniatures. Glue the pieces where you want them. 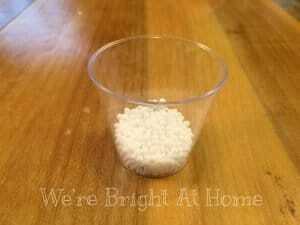 You can also use glue dots. It would be less messy if you are doing this with children. My son and I used hot glue, but you could use Tacky glue or the glue dots. Pour the snow into the shot glass. Do not fill it too full or it will cover too much of your miniature. It takes very little. You can also use table salt or Epsom salt. Run a line of glue on the edge of the circle cut out. 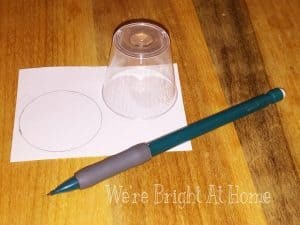 Place the cardstock circle onto the shot glass evenly. You have to work fast if you are using hot glue. It will dry before you get the circle stuck to the shot glass. 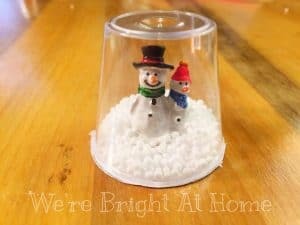 If the glue looks gloppy or thick in spots, turn the snow globe over so the snow will fall and stick to cover it up, taking care not to spill any of the snow out of the globe. Cut the desired amount of bakers twine (or yarn, string, etc.) to create the hanger for the ornament. Thread it through one button at a time if you are using two. 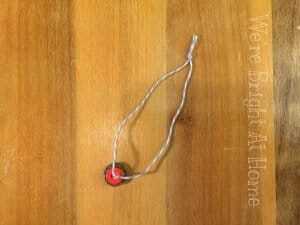 Tie a knot on top of the buttons then tie a slip knot to form a loop for hanging. Glue the button with the hanger attached to the middle of the snow globe. Decorate! My favorite part! Glue the chenille stem around the bottom of the ornament. Add pine accents, pinecones, miniature flowers, etc. Use your imagination! I hope making your own handmade ornaments will become a tradition at your house as it has at mine. It’s, even more, fun to look at them years down the line and knowing how old your child was when they made them. I still have the ornaments my oldest son has created since he was 3 years old. He is 21 now. That makes them even more special. My youngest son has been creating ornaments since he was 3. He will be 10 in a week. Where does the time go? If you need to make several ornaments shop online and have the supplies shipped for FREE to your local Dollar Tree for pickup. If you enjoyed making the Santa list ornament, you should definitely check out this one!